Last week’s tip about high self-orientation reminded me of a funny and instructive story about Big S issues (mine). It includes important signs to look for that will help you up your trust game. Once upon a time, my own Big S came to light (again) when I was at dinner with a group of clients—specifically, four members of the design team for a pilot workshop I was leading the next day. It was the first time we were meeting in person, after a series of productive phone conversations. Our dinner chatter was as amicable as our virtual interactions had been. It also seemed stilted, for lack of a better word, as we got to know each other. There wasn’t a sense of immediate ease that sometimes happily occurs. About 45 minutes in, we were talking about the Trust Quotient diagnostic results for the pilot group, and one of the members of the team made a (half) joke about being self-conscious during the dinner conversation as she figured I had been using that time to diagnose them. I could only laugh, as I had been doing anything but that—in fact, I had truthfully only been partially participating because I was distracted by “Do they like me?” thoughts. If you’ve been a long-time reader, or a workshop participant, you know that my desire to be liked is one of my own Big S drivers. Awkward conversation is a common trigger for my self-obsessive monologues. Therein lies the lesson: The moment you find yourself engrossed in “me-me-me” thoughts, rest assured there’s a good chance those around you are doing the same. 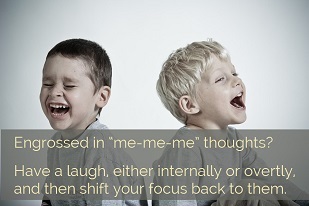 Have a laugh, either internally or overtly, and move on to something more interesting—and more trustworthy—like focusing on them rather than you. As my co-author Charlie Green has always said, trust increases not when you think less of yourself, but when you think of yourself less. This week, look for opportunities to confess your own self-obsession—ideally with both confidence and humor. Even if you don’t have the courage just yet to actually do it, notice where and how you might. 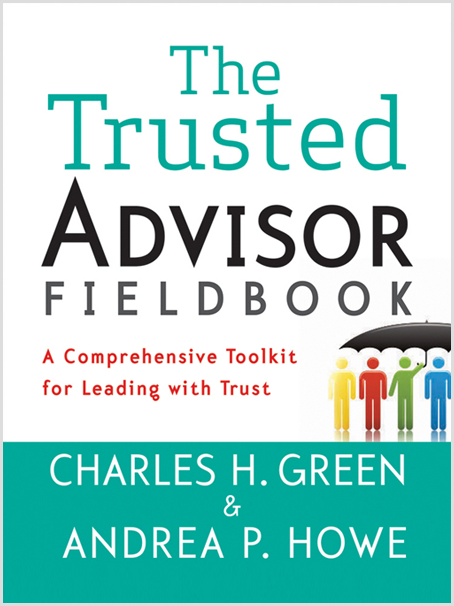 Watch a short video lesson on why nobody cares about you and you should be glad (Trust Tip #9), from our friends at Trusted Advisor Associates, or brush up on ways to lower your self-orientation quickly in Chapter 21 of The Trusted Advisor Fieldbook.